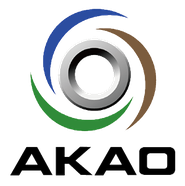 As a symbol of the union of employees of Akao Aluminum, a "ring" expresses this with a motif of a circle. At the same time, the ring also represents "Japanese" for not only kitchenware but also Japanese manufacturing. The three elements surrounding the ring conform to the founder's philosophy of "follow the path, fear the heavens, respect the earth, be considerate of people". The "path" is brown, the "heavens" is sky blue, the "earth" is green, and the inner circle is silver, the color of the material, to symbolize the aluminum business that respects the "connection between people". In 2017, Akao Aluminum celebrated its 70th anniversary. We will continue to aim for a 100 year anniversary as a company.